"The effects could well be called unprecedented, magnificent, beautiful, stupendous, and terrifying. No man-made phenomenon of such tremendous power had ever occurred before. with the intensity many times that of the midday sun." Oh, my . . . sounds like a radical departure from running around McDowell Mountain Park, doesn't it? It is. 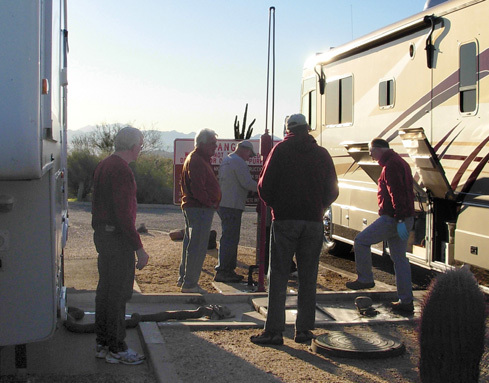 The next part of our trip will be different from the three restful weeks we stayed in one place near Phoenix, basking in the (mostly) warm Sonoran Desert sunshine. Now we're on the move again with new adventures and new camping venues until we reach the race site for the Rocky Raccoon 100-miler in ten days. En route we'll be spending a few days playing "tourist" at various places in New Mexico and southern Texas. Hopefully we'll find some interesting places to run, too. It was sad to leave McDowell Park this morning. It's such a beautiful place with lots of great trails to run. And we're spoiled being in one spot for so long. You can't imagine the amount of work and time that saves us. but it took four fellas some time to help the guy on the right with a problem he had. But this would begin another chapter in our trip. Today's goal was to reach the White Sands Missile Range northeast of Las Cruces, New Mexico, a drive of just over 400 miles, before dark. We made campground reservations at the post with the intention of exploring the nearby dunes at White Sands National Monument tomorrow, then heading on to Carlsbad in the afternoon. We ended up finding more to do at the missile range itself than we expected. 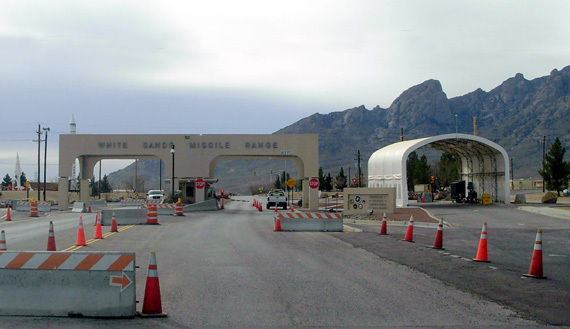 It has been many years since either of us has been to White Sands National Monument and neither of us has been on the post in the missile range, site of America's largest overland military test range. This place is HUGE -- 3,200 square miles (not acres!) -- covering a lot more Chihuahuan Desert territory than the little black square shown on our AAA map. 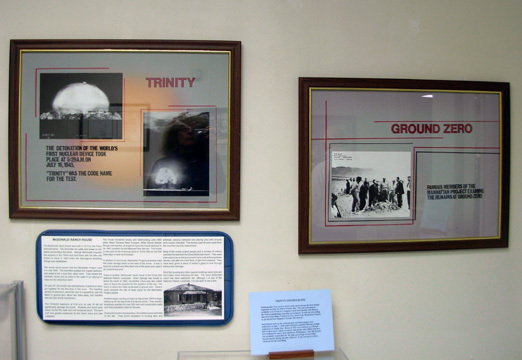 We already knew some of the history of the (in)famous Manhattan Project and Trinity Site, but we had the opportunity to learn a lot more about the history of the missile range "from prehistoric farmers to hard rock miners to rocket scientists" at the comprehensive museum on post. We had great weather during today's drive and traffic was light once we got beyond the Phoenix metro area. Waiting until almost 9 AM to leave the campground helped us avoid the worst of the morning rush hour -- but not the rush for the campground's dump site (photo above), as we found ourselves behind a caravan of half a dozen RVers traveling together. Then we had to go toward Phoenix before we could get away from it. Our route was the same one we took from McDowell Park to Carlsbad Caverns four years ago. 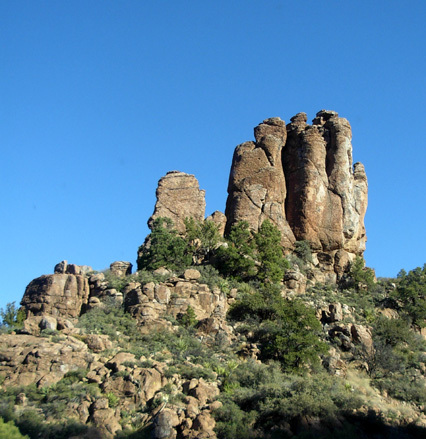 First we headed east on US 60 past the towns of Apache Junction and Globe through the Superstition and Pinal Mountains in the southern part of Tonto National Forest. I enjoyed all the rock walls, the Queen Creek Tunnel, and the 4,612-foot pass dubbed "Top of the World" in this section. At Globe we turned onto US 70 and followed it through Ft. Apache Indian Reservation and the Gila River Valley between the Gila and Santa Teresa Mountain ranges to the New Mexico state line and Lordsburg. We could see snow on top of the 8, 000- to 10,000-foot peaks in the Coronado National Forest near Safford but there was no snow anywhere near the roads we traveled today. We hopped on I-10 to Las Cruces, picked up US 70 again NE of town, and climbed up (to about 5,700 feet) and over the Organ Mountains to reach the missile range. What a view east toward the Tularosa Basin! Four hundred and one miles in 7� hours with two stops for fuel, lunch in the camper, and potty breaks -- not too bad for hauling our house-on-wheels with us through some mountains! We enjoyed this route and would use it again unless there was ice or snow at the higher passes. 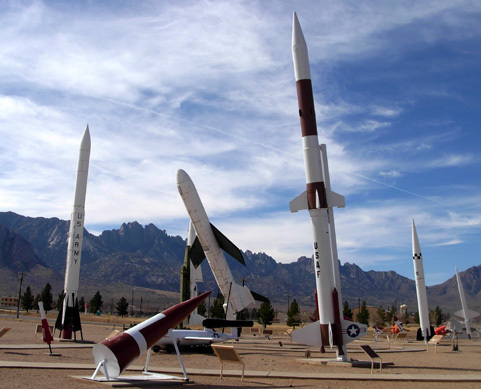 We had a couple surprises upon arrival at the missile range, which is about 20 miles east of Las Cruces, 45 miles north of El Paso, and 50 miles west of Alamogordo. 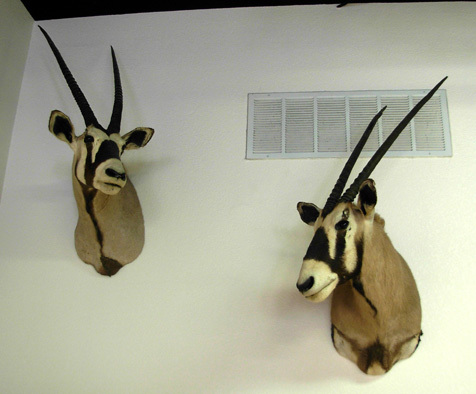 The silhouette of the antelope-like critter with the distinctive horns looked familiar since we've seen stuffed ones at Cabella's stores around the country, but we couldn't remember the name "Oryx" until we saw photos and more stuffed heads (below) at the museum on post. The fact that these animals are now unexpectedly and overly prolific in southwestern New Mexico, after being imported from the Kalahari region of Africa in 1969, is one of those "but it seemed like a good idea at the time" government snafus. The New Mexico Dept. of Fish and Game introduced the Oryx to the missile range as part of an exotic animal program (not sure what that was all about). For some reason, no one predicted they would roam outside the range. Granted, the missile range is very large -- roughly 40 miles wide and 100 miles long, minus a few hundred square miles -- but it isn't fenced. So wander they did, and now the Oryx have created "management problems" throughout the Tularosa Basin and White Sands National Monument. 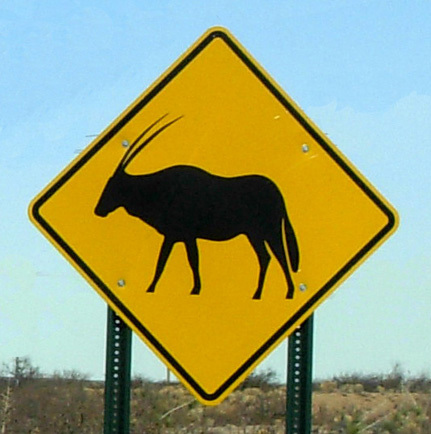 The Oryx are a road hazard from the Texas border to Albuquerque and a runway hazard at Holloman AFB. Oops! In addition, there are no natural predators of the Oryx in New Mexico. Their population is controlled in the Kalahari by lions. 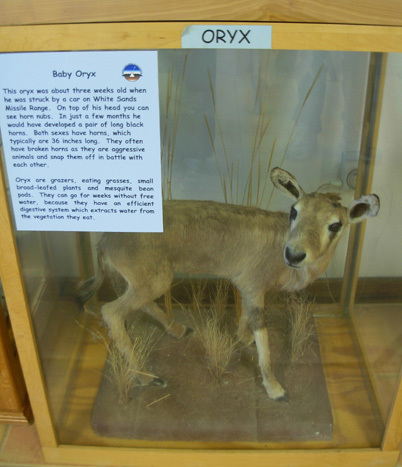 As a sign at the museum wryly notes, "Since there are no African lions on the missile range, the New Mexico Fish and Game Department has instituted a hunting season to control the oryx population. Licenses for the hunt are issued by a lottery system. After receiving a permit, a hunter cannot apply again. It is a once-in-a-lifetime hunt." If there's a lottery, there must be more people chomping at the bit to kill an Oryx than there are Oryx that need to be culled each year. What a deal: you don't even have to go to Africa any more to bag an Oryx. At least it's not one of those ridiculous enclosures where the big game has no sporting chance of escape from the "hunters." Sorry for the mini-rant. After seeing these beautiful animals in real life (near the road!) and knowing the history of the exotic-animal-experiment-gone-bad, the solution to Oryx overpopulation strikes me as ironic and unfair. But when you think about how they are likely to die in their native Africa, from lion teeth puncturing their jugular and being eaten organ by organ, limb by limb, I suppose a well-placed bullet is humane in comparison. Still . . . This is the fifth or sixth military installation we've used for camping the last few years and it was the most rigorous entry process to date. These guys are thorough! Be aware of that if you ever visit the post for any reason (museum, missile park, Bataan Memorial Death March, etc.). The usual process for us has been for the entrance guard(s) to glance at our military IDs and maybe our drivers' licenses and to ask a question or two before waving us and the camper through the gate. Pretty simple. At Fort Meade in Maryland there was an additional cursory check of the camper. Here the two young Army guards checked our drivers' licenses and military IDs (not noticing or mentioning that my military card had inadvertently expired two weeks ago! ), truck and camper registrations, and vehicle insurance cards. They asked one of us to stand a good distance away with the dogs (I got that job -- gotta watch these killer Labs!) so they could inspect inside the truck and under the hood. AND they wanted all the camper slides and basement doors opened so they could see everything inside the living area and storage area underneath. Jim was busy opening and closing doors for several minutes. I was dispatched too far away with Cody and Tater to hear any conversation with the guards. That was probably for the best. Wow! All that for a couple of retirees traveling with their two dogs in a camper!! I thought it was a little over the top but Jim-the-retired-military-guy says they are just doing their job to safeguard the post and the 2,000+ people who live and work there. For all they knew, we might have mischievous intentions. White Sands allows many non-military visitors to enter the post because of the numerous tests occurring here. Besides our own Defense Department, private industry and foreign nations conduct laser, radar, and flight research at WSMR. 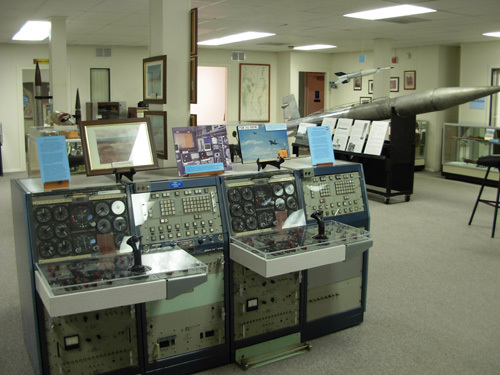 In addition, the range museum and missile park are open to the public. That probably accounts for the more thorough entry process at this installation than the others we've visited. We enjoyed our short time at this campground. I'll show some photos and talk more about it in an entry after our trip is over, comparing the various types of places we stayed. The museum just inside the entrance gate is a great place to learn about the history of the missile range, literally from the earliest inhabitants of the Tularosa Basin (the wide desert valley between Las Cruces and Alamogordo, New Mexico) to detonation of the world's first atomic bomb to early Space Age rocket testing to current national and international research that is conducted here. Visitors don't have to have military connections to visit the museum, outdoor missile park, or Trinity Site -- they just have to pass muster at the entrance gate! Admission is free. We spent about an hour inside the museum and walking around the missile park outside. If we'd had more time, we could have read a lot more of the information with the displays. A bit of history: the museum looks back to prehistoric times, displaying artifacts from the campsites of hunter-gatherers who killed now-extinct camels and mammoths for food. 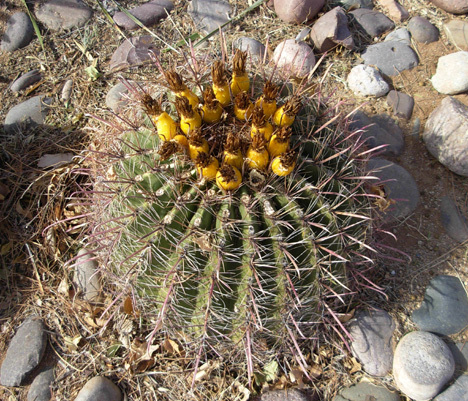 Their grinding stones, pottery, and rock art have been found all over the missile range. More recent inhabitants built permanent pueblo structures. 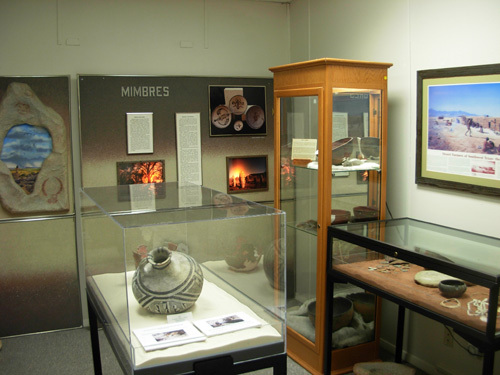 Spanish explorers and missionaries arrived in the area in the late 1500s. The "Camino Real" ran along the Rio Grande River just west of White Sands. There were many conflicts over the nest three hundred years between local Apache tribes and European, and later American, settlers until the defeat of Chief Victorio's Apache followers in 1880. Next, ranchers and miners flooded into the Tularosa Basin. Ranching was tough in this very dry area. Miners found a wide variety of minerals in the surrounding mountains but never struck it rich. Eventually the government took over the huge territory I've already described. 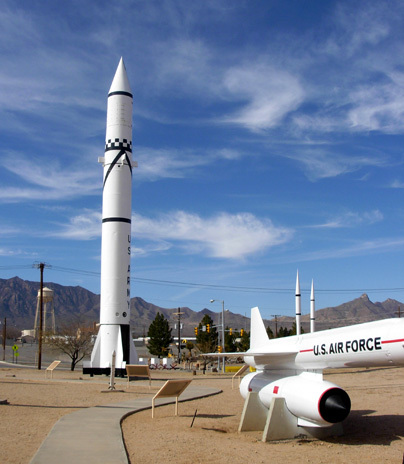 The White Sands Proving Ground was established at the end of WWII to test the atom bomb and emerging rocket and missile technology, such as the German V-2 rocket. 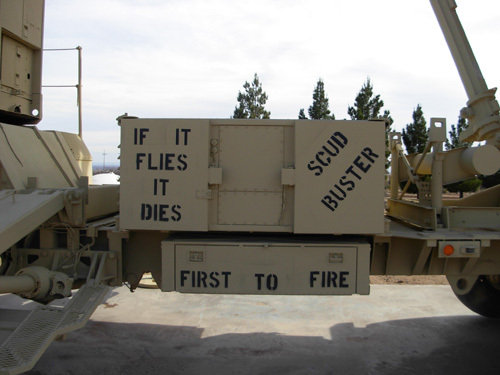 The range continues to develop and test new weapons systems for the Army, Navy, and Air Force. It also conducts purely scientific research and tests advanced missile and laser technologies, such as the THAAD missiles that strike targets directly to destroy them. The range has an alternate space shuttle landing site where Columbia landed in 1982. 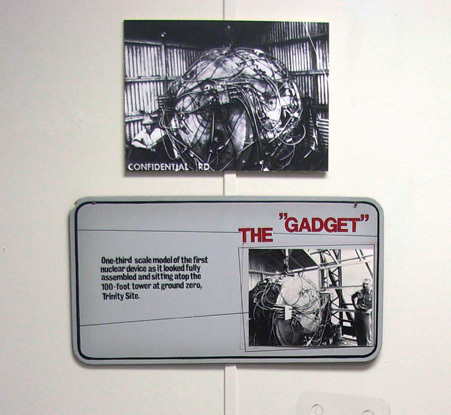 You can learn about this complete time-line in the range's museum or at the official web site. It's more fun at the museum than the web site, though, whether you're a big kid like us or a little kid! 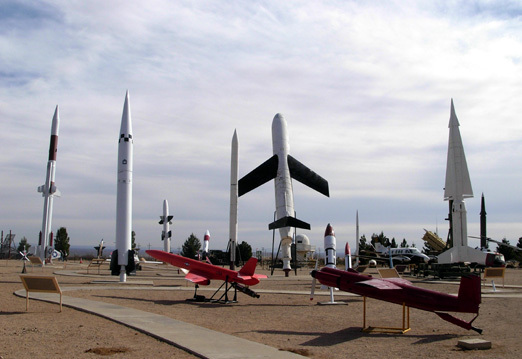 Outside the museum, the Missile Park has an interesting display of over fifty rockets, missiles, and launchers that have been tested on the range. Each one is clearly marked with a sign that tells its purpose and history. 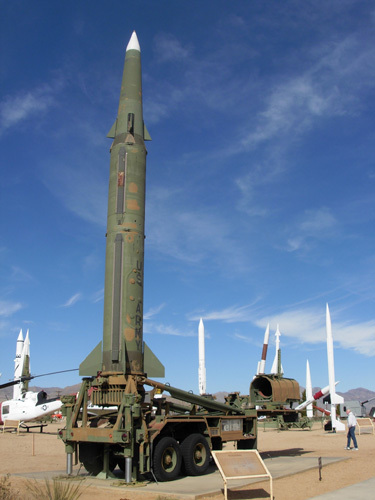 Some of the missiles are famous ones you've probably heard of, like the Pershing, Patriot, and Redstone missiles. A pamphlet we received at the museum says there have been more than 42,000 missile and rocket firings at WSMR. 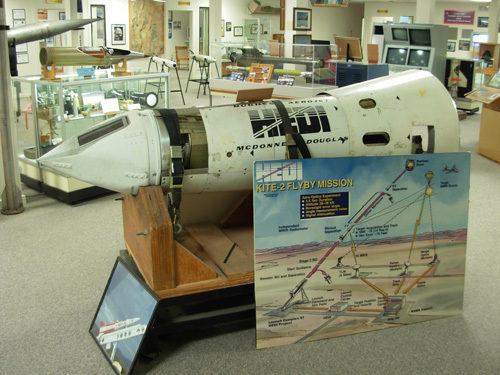 Here are photos of a few of the missiles and rockets on display. See the web site link below for more photos and information, if you are interested. fired in 1958. Redstone boosters sent our first satellite into space -- and Alan Sheperd in 1961. 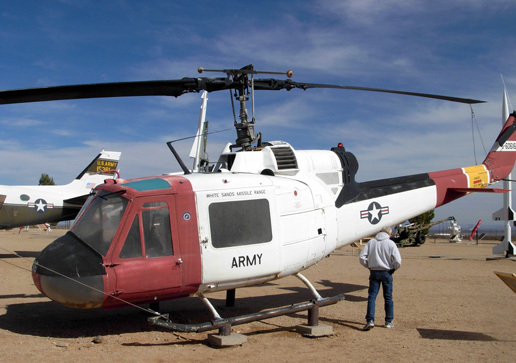 There are some other "flying machines" on display outside, such as this Huey helicopter from the Viet Nam era. Jim flew in one of these when he was over there in the Army, but he said his never had doors! 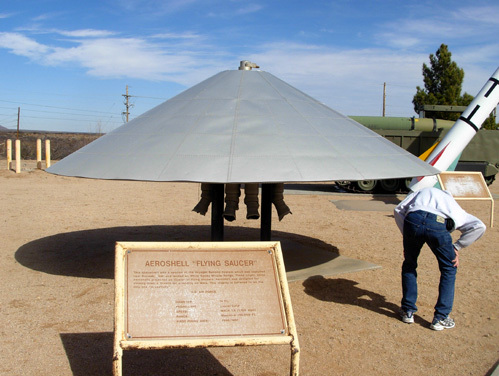 Aeroshell was launched near Roswell and landed at White Sands Missile Range. 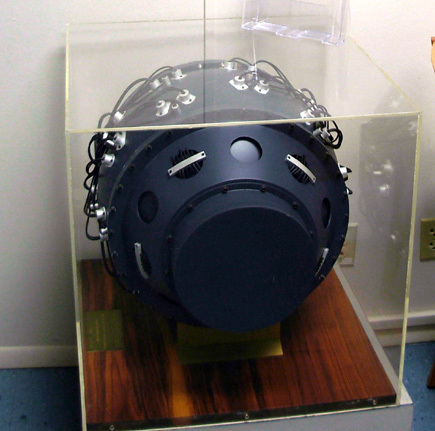 The bright, shiny cone projected the illusion of a flying saucer but its real purpose was to slow down a vehicle landing on Mars. There is some running or hiking content to this entry! 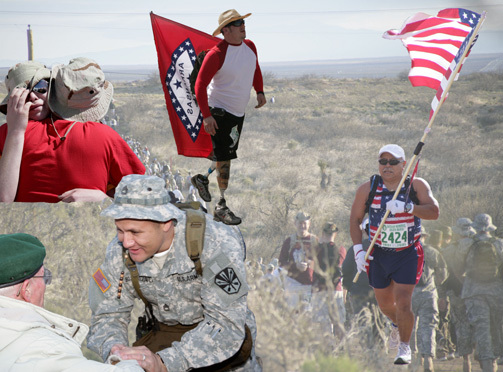 Each year since 1992 a challenging march has been conducted through the high desert terrain at White Sands Missile Range in honor of our heroic service members who defended the Philippine Islands during WWII. (The event was begun in 1989 at another location.) Over 4,000 people participated last year in the full marathon (26.2 miles) and shorter 15.2-mile events. This year's event is scheduled for March 30. Although most of the participants are members of the military, civilians can also take the challenge as individuals or in five-person teams. There are awards in various categories for the individuals and teams that arrive at the finish line first (only in the marathon) but the event is not considered a "race." However, the men's winning time of 3:16 in 2007 indicates running was involved, not just walking. The course profile and description of the high desert terrain look difficult. I don't know how hard it is to enter the event, but I'd like to participate sometime. I encourage you to spend some time on the White Sands Missile Range web site for further information: http://www.wsmr.army.mil/ Click on the links to "Visitors" and "Public Affairs" for a wealth of information about the history of the range itself, the U.S. missile program, and the Trinity Site (which is open to visitors only twice a year and is located many miles away in the northern part of the range). On the web site are numerous photos and a lengthy visitors guide in pdf format that is interesting to read before you visit the post or the area. It includes information about the three closest cities (Las Cruces and Alamogordo, NM and El Paso, TX) and the White Sands National Monument. Speaking of which, that's the focus of the next entry -- the gorgeous white gypsum sand dunes that give "White Sands" National Monument (and this whole area) its name. Come along and play with us in the dunes tomorrow!